The moon rock that was stolen from the Natural History Museum in Mdina. 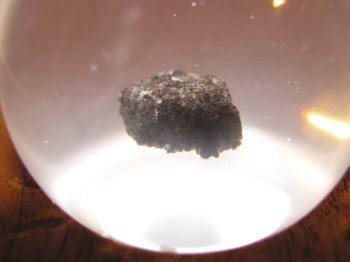 A retired Nasa inspector has urged Malta to make another attempt to repossess the moon rock stolen from the Mdina museum over a year ago, amid claims that it has probably not been put up for sale. Joseph Gutheinz, who was instrumental in retrieving a stolen moon rock in Honduras in 1998, has called on the authorities to offer an amnesty to retrieve the raisin-sized stone estimated to be nearly four billion years old and valued at around $5 million. The moon rock, weighing barely more than a gram, was brought back to Earth by Apollo 17 astronauts in 1972 from the moon's Taurus Littrow Valley. Three months after Apollo 17 returned home, President Richard Nixon distributed fragments of the rock to 135 foreign heads of state as a sign of friendship. The Malta theft has re-ignited interest in moon rocks, as evidenced by the several websites discussing its disappearance. NASA keeps its moon rocks under lock and key, and all but about one ounce of its 842 pounds of the rocks, pebbles and dust brought back by the astronauts are accounted for. The value of moon rocks can only go up, at least until man returns to the moon. After the Columbia disaster, Nasa and the US government offered an amnesty period so that people, upon reflection, would voluntarily return pieces of the destroyed shuttle they had taken. "If an amateur took the moon rock, he was likely thinking like a petty criminal unaware of its value, so why not give this thief a chance to put it right," he said. Dr Gutheinz is persistent in his cause for the retrieval of the Malta rock to the extent that he is even willing to offer $1,000 as a reward. Failing that, the retired inspector said the Maltese authorities should ask Nasa for a new moon rock. Alex Gatt, from the Institute for Astronomy and Astrophysics, agrees that Malta should request another moon rock from the US, should it fail to be returned. "It's not easy to retrieve what is ultimately a rock no larger than a finger nail. The US still possesses some 300 kg of moon rock and there is nothing wrong in asking. What worries me is whether security has been stepped up at our museums," Dr Gatt said.